The Advanced Pre & Post Formula is recommended by your physician to support the body through invasive aesthetic treatments. There are 2 regimens; 14 days and 30 days. The 14-day kit is recommended for less-invasive procedures. The 30-day kit is used for invasive procedures. Our specially designed formula prepares the body for cosmetic procedures to enhance recovery time. The Pre & Post Formula was formulated to address all levels of wound healing by helping in connective tissue formation and maintaining immune function. Gotu Kola seed Stimulates collagen production to improve skin firmness and help minimize scarring. Horsechestnut seed Contains aescin which helps with vascular protection. Strengthens the circulatory system to bring nutrients to the wound for healthy healing. Glutamine Critical amino acid required for wound healing. Helps to reduce acidity in the body. Glucosamine sulphate Amino sugar which is a precursor for glycosaminoglycans (GAGS) which are a major component of cartilage. 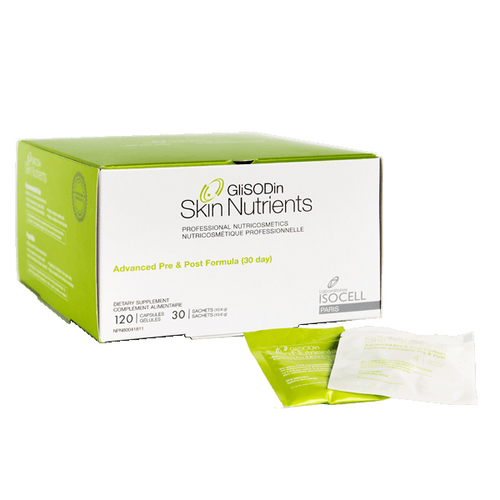 Acts as an essential building block for collagen production. Use before and after all aesthetic procedures. 14-day formula - Take one sachet of powder and one sachet of capsules daily for 7 days before the procedure and for 7 days post-treatment. 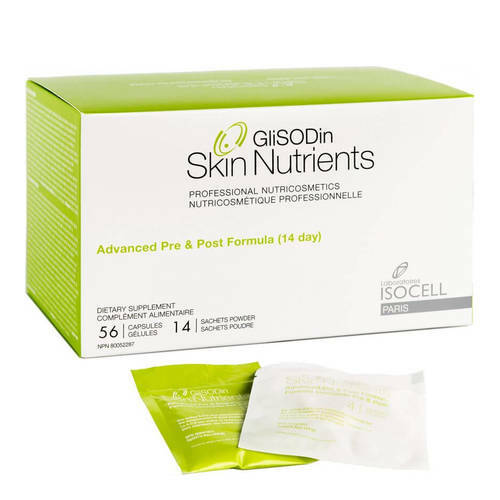 Once completed, use the Skin Brightening Formula as directed to maintain the GliSODin glow.